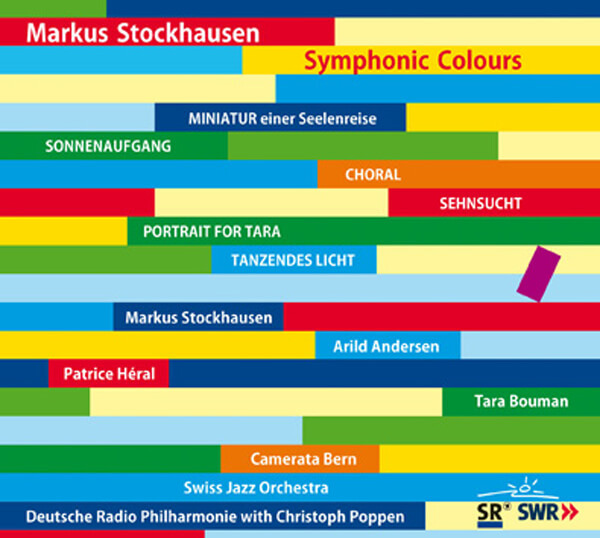 You're currently browsing page: /trompeter-musiker-komponist/86/symphonic-colours/?lang=en of www.markusstockhausen.de. Jazz meets Symphony – Markus Stockhausen is one of the most versatile musicians of our time, being equally at home as trumpeter, improviser and composer, in jazz, contemporary and classical music. Here is a cross-section of his work from the years 2001-2007, as presented by the Deutsche Radio Philharmonie under its chief conductor Christoph Poppen, in a concert at the Saarland Radio’s Großen Sendesaal in Saarbrücken on 4th April 2008. On the program were works by Markus Stockhausen for solo-instrument or jazz trio with orchestra. Fascinated by the border between improvisation and through-composed score, Markus Stockhausen leaves the soloist much room for improvisation. The guest performers were Arild Andersen (bass), Patrice Héral (percussion), Tara Bouman (basset-horn) and Markus Stockhausen himself (trumpets and flugelhorn). This doube album presents the following works from the concert performance: MINIATUR EINER SEELENREISE for trumpet and string orchestra, SONNENAUFGANG, CHORAL und SEHNSUCHT for jazz trio and orchestra, and PORTRAIT FOR TARA for basset-horn and small orchestra. TANZENDES LICHT for trumpet, big band and string orchestra rounds off this presentation of works by Markus Stockhausen. This recording is of a live performance by the Swiss Jazz Orchestra and the Camerata Bern at the BeJazz Festival in Bern on 20.1.2008. Only critics in german available at the moment, please go to the german site of this CD.